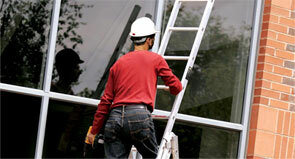 The one-in-four rule ensures you are placing your ladder at the right angle. Any leaning ladder should be at a 75 degree angle, and the simplest way to achieve this is to have the ladder one unit out from a well for every four units up. Climb using three points of contact and work in the same way wherever possible. You should only let go of a handhold briefly, as when starting to knock in a nail. While climbing, always be facing the ladder and gripping it firmly, and use a tool belt rather than climbing with anything in your hand. Use the belt-buckle test to avoid overreaching to the sides. If the area where your belt buckle should be is outside of the stiles, you are overreaching and should go back down and reposition the ladder. Never adjust the ladder while on the rungs. Make sure the ladder is long and high enough for the task being carried out. Stretching upwards is to be avoided, as is working from the top three rungs. Never stand the ladder on a moveable object (eg. pallet, bricks, tower scaffold). Do not overload. Think about the worker’s height as well as equipment or materials being carried. More information should come from manufacturers’ labels on the ladders themselves. Avoid overhead power lines – do not work within six metres horizontal to one unless it has been made dead or protected with insulation. Any electrical work should involve a non-conductive ladder made of, for example, fibreglass or timber. 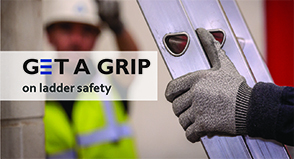 Make sure you tie in any leaning ladder, use a strong upper resting point rather than, for example, plastic gutters, and consider using an effective stability device. Check all four feet of the stepladder – they must all be in contact with the ground, and the steps should be level. Keep to light tools and materials. Do not overreach and do not stand on the top three steps to work unless a handhold is available above this point. Ensure locking devices are engaged. Be careful of the dangers of side loading, like drilling from the side. Aim to be facing the work instead, unless a risk assessment advises otherwise. When a side load is likely, tie in the steps or ensure they will not tip over. Keep three points of contact – two feet and one hand. If both hands are briefly required, use the stepladder to support your body for a third point of contact.